Prepare: The first and foremost step to a successful bingo game is to prepare yourself for the game. This requires the player to arrive at least half an hour before the game starts. There are players who arrive one or two hours prior to the beginning of a session. On arriving, purchase your cards, relax and talk to those around, have some refreshments and set up your space. Everything you may need during the game should be close by e.g. your phone, a drink, etc. Arrange Important Supplies: Supplies like highlighters, bingo daubers, masking tape, glue stick, and even lucky charms can greatly increase the chance of success in the game. Bingo daubers help players mark the numbers which have been called. Masking tapes help secure the cards together so that you don’t have to waste time adjusting them. With all your essential supplies around, you are likely to be less distracted. Choose A Seat: It is believed that choice of a seat in a game of bingo has a huge impact on the performance of player. It is best to sit close to the caller. This will help you remain focused and listen to the numbers clearly. Try to sit on a seat with minimal distraction in order to stay away from talkative players and friends. Be Alert: It is crucial to remain alert during a bingo game as missing out on even one number has the potential of pushing you further away from winning. 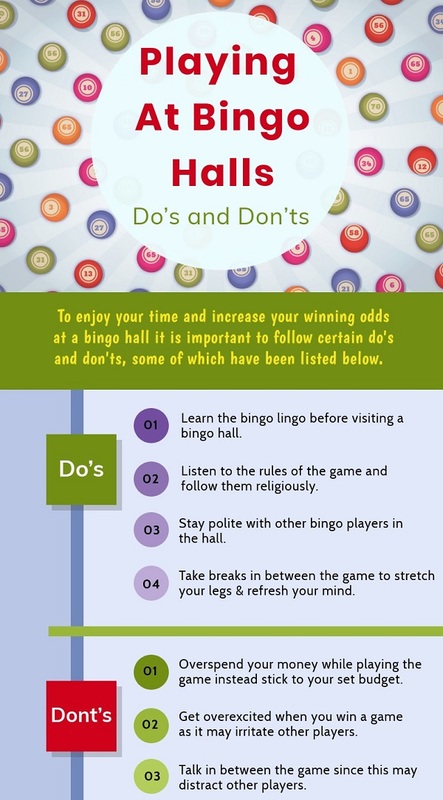 A little bit of light exercise prior to a game of bingo can be helpful in stimulating your senses. Also Take scheduled breaks. Play with more cards or buy few cards and play more games. Use a highlighter to mark your cards in special pattern games.